Cows are big hulking creatures—not so great for tipping over while drunk, but great for turning into living factories that make massive quantities of antibodies. 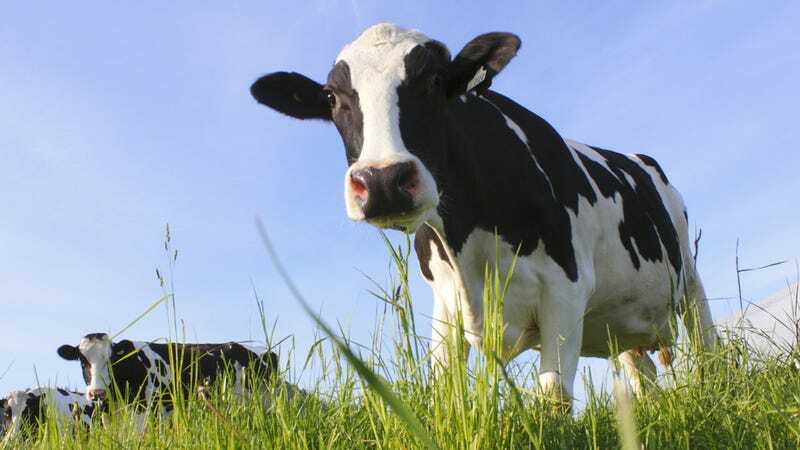 Scientists have inserted a modified human chromosome to cows that can now make human antibodies for hantavirus. Other deadly disease like Ebola and MERS could come next. Antibodies are proteins made by our immune systems to neutralize invading bacteria and proteins. They're specific to each pathogen, and they're hard to come by. Recently, Ebola survivors in the U.S. have been donating their blood so that Ebola antibodies can be extracted for other patients. But there could be a better way, and that way involves cows. For years now, geneticists have been working on sticking human chromosomes into cows. In this recent study published in Science, they finally succeeded in making cows who, in turn, made human antibodies. They took pieces of human chromosomes 14 and 2, which contain the genes for making the antibody for hantavirus, and combined them into an artificial chromosome that was inserted into cows. This silenced the corresponding bovine genes for hantavirus, so the cows only made human versions of the antibody. The antibodies were tested in hamsters infected with hantavirus, the rare but deadly virus spread by rodents that most recently caused an outbreak in Yosemite National Park. The hantavirus antibodies dramatically improved their odds of survival.